I’ve been to many PrideFests since high school, but the one that left a lasting impression was in 2001, when Joan Jett played in Tower Grove Park. I remember seeing so many faces I recognized from punk shows around town and feeling like the community I’d chosen was on my side. When PrideFest moved downtown, I was sad to lose the nostalgic connection to Tower Grove Park, but I went anyway. I had mixed feelings about the gigantic turnout. It felt like the entire city was there to support my family. (Only my family though. Transgendered people were conspicuously absent from the programming.) There were plenty of Budweiser signs, though, plenty of crap to buy, and plenty of booze. Although it was still tons of fun and I’m glad I went, it felt like something important had been lost — that feeling of community, of neighborhood togetherness, and, frankly, the edginess that made Pride so fun. 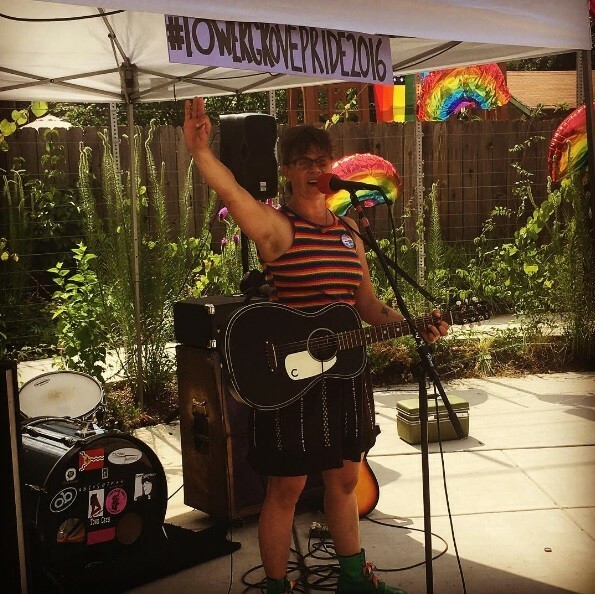 That’s why Tower Grove Pride has become such an important staple of summertime in St. Louis in the four years since its inception — an alternative to the more official celebration, with no corporate sponsors and a more inclusive environment. Leadership has changed hands a few times, but it continues to enjoy the support of the neighborhood and the South Grand Community Improvement District. Melinda Cooper, longtime rocker, frontwoman of Town Cars, friendly face behind the counter of Local Harvest and Foam (and occasional RFT contributor) organized the festival this year. Intimately acquainted with St. Louis music, she took special care with booking the bands. The bands and DJs performed in Ritz Park — the pocket park next to Mangia Italiano that used to be a parking lot, transformed into a landlocked beach by Autumn Wiggins of Create Space. The fountain that lazily cascades through tiered concrete troughs was lined with over a dozen beach-balls, brightly colored umbrellas were scattered along the grass and flower-shaped balloons accented every crevice, later popping like crazy, expanding and exploding in the mid-afternoon sun. The bands were diverse — musically, racially and along the LGBTQIA+ (lesbian, gay, bisexual, transgender, queer, intersex, assexual and all others) spectrum. The first band to catch my attention was Duck Brown, a ska band (yes, those still exist), who bounced to the backbeat in the merciless heat. I was impressed even before their stunningly solid cover of TLC’s “Waterfalls.” Event-appropriate cover songs ruled the day: Skin Tags did a cover of Nirvana’s “Been a Son” and Celia Shackattack covered “Somewhere Over the Rainbow” and “The Rainbow Connection” to a rapt audience of tiny, red-faced children. Mirror Mirror played the most satisfying set of the day. Aurora Schmidt and Taylor Bour traded vocals that alternated between lovely and demonic, summarized nicely by their own lyrics: “Tell me I’m ugly; tell me you love me.” They played as heavy raindrops began to fall, popping the bubbles that streamed steadily from the machine in the DJ booth and causing Cooper to cover the equipment with trash bags and tarps to avoid any catastrophes. She predicted the rain very early in the day, pointing to the curliest of her curly blonde hair and saying, “thunder-curls don’t lie,” an expression I’d never heard but plan on using at inappropriate times for the rest of my life. By the time activist, photographer and spoken-word artist Stephen Houldsworth spoke, the rain was streaming down. Despite the downpour, Houldsworth commanded attention from a crowd that obviously held his opinions in high regard — they huddled in packs under the tiny beach umbrellas and squeezed under the DJ tent to hear him speak. He began with a loving-but-firm critique of Tower Grove Pride, saying that it ought to include all of the people the festival is supposed to celebrate by putting LGBTQIA+ the title of the festival. 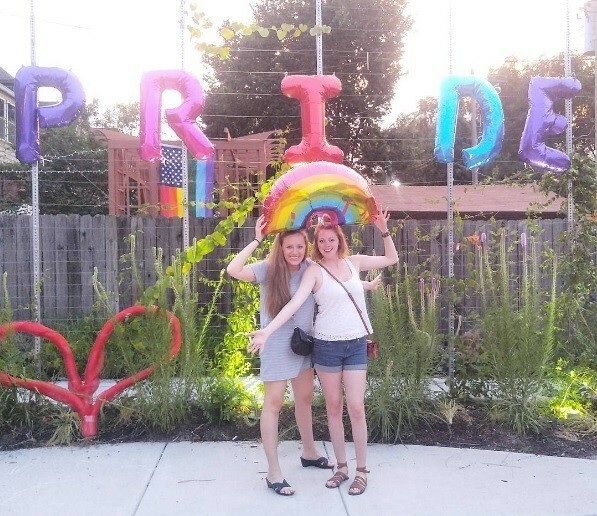 “Pride” is a fairly generic term, and without drawing attention to the more marginalized within the community, they remain easy targets for violence and hatred. “It’s important to say the words. A trans woman was beaten up after leaving a Pulse vigil because she was trans,” Houldsworth said, reminding the audience that when he was young being gay was illegal, and that it was only through direct action that anything changed. He stated his preference of Tower Grove Pride over PrideFest because of the lack of major corporate sponsors, but he noted that “all Pride Festivals have to change” to reflect everyone within LGBTQIA+, including Tower Grove Pride. My dad showed up halfway through the event, and, being motivated by a love of climate-controlled environments and an aggressive sweet tooth, spent the majority of the festival lamenting the lack of food trucks and cursing the weather. 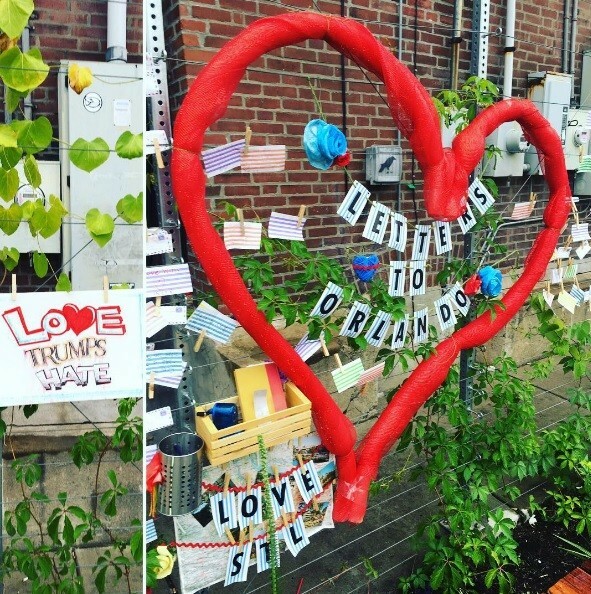 But it did seem as though he enjoyed the neighborhood’s unwavering, unabashed support for a people who, just a few years ago, were not legally allowed to express their love. As Houldsworth made sure to point out, we are a long way from winning equality, but it sure is nice to see the progress we’ve made celebrated by the best block party in St. Louis. Jenn DeRose is an RFT contributing writer and longtime St. Louis resident.